If you are looking for a ride on tractor for your child, you will soon discover that there are a myriad of different types available all boasting a range of features. Due to the high level of durability and versatility, the tractors have within a playing environment, the ride on tractors are a perfect addition to any playset. These children’s tractors are suitable for a variety of ages, because of their varying styles, colours and designs. This is perfect for younger aspiring farmers who are too young to operate the tractor but still wish to get a taste of what it feels like to be behind the wheel. There are two different types of ride on tractors; they can be either battery powered or be operated by kinetic energy. Obviously while the battery powered model does simulate the tractor in a more realistic way, but the push operated models will provide your child with an excellent way to get some exercise and have fun at the same time. As well as this, there are different tractors of different weights which can further improve or lower the authenticity of the tractor, and some models may also include things such as trailers and headlights to give a more realistic play time. So perhaps one of the most important features of this particular tractor he is the fact that it’s electric. This means that you will no longer need to operate the tractor under your own steam, now you can just enjoy the automation, which brings a new level of immersion to the experience. This high degree of immersion is further complemented by the functional radio which is included, allowing for a realistic scenario of driving down a country lane with the radio on to wherever is you need to be. The lightweight design and durable nature of the model make it perfect for young children aren’t always be careful, but instead, gives them more freedom to explore their adventurous minds and to push the models to its limits. Overall, a fantastic electric powered tractor that’s sure to delight all the aspiring young farmers out there. Immediately upon looking at what this tractor can do, it’s clear to see that it was designed well and to a high quality. The top speed of 7km per hour is slow enough to ensure that there aren’t accidents, but at the same time gives the young aspiring farmers a taste of what it’s like to be on a powerful machine. Intelligently designed, the model has a straightforward and realistic on/off construction to ensure that the entire experience is fully immersive, which is further highlighted by the steering wheel that makes accurate noises. The sturdy and durable design of the model allows for constant wear and tear without worry for permanent damage to vital parts, which means your little one can keep on playing to their heart’s content. And as a bonus, the tractor comes pre-assembled, so all you need to do is open the box, install the battery, and you’re ready to go. The first point which is positive about the John Deere loader is the fact that it’s electric. This means that instead of relying on manpower and pedalling, the model will operate entirely under its own propulsion. This feature gives you a deeper level of realism, which is further highlighted by the fully functional FM radio. With it, you can fully appreciate the scenario of driving down a country lane to some charming music. The model is of a heavy duty design, which means it is built to last, so your little ones can thoroughly enjoy the experience of a tractor without the worry of breaking it. Overall, this is an excellent piece of kit that will bring many hours of joy and a realistic tractor experience. To start with, one should note that this model was clearly designed to be versatile and reliable. This is demonstrated by the front and rear hitching pins, which is not a feature present on most of the models, where usually only one hitching pin is available and is generally located at the rear. This great feature allows for a more versatile playing experience. The adjustable seat is a good example of modern comforts, and allows for a broader audience as children of all heights and builds will fit with ease. As well as the hard-wearing and durable design means that this model can withstand a lot of punishment. This ensures that kids can play with no concern for damaging the tractor. Overall, this is a well designed and a highly practical tractor and provides a realistic replication of what it would be like to drive a real tractor, which is ideal for aspiring farmers enthusiasts. This tractor has many different features to appeal to aspiring farmers and tractor enthusiasts. The experience is immersive and realistic right down to the self-propulsion of the vehicle itself, to the safety belt and working headlight, this model is cleverly designed to ensure the most authentic experience possible. 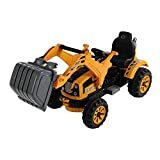 A durable and compact construction means that this model can take large amounts of being bashed around and still keep going, which means that you will have hours of fun and a reliable toy for a long time. Stylised as a yellow digger, this model encourages a deep level of imagination and kids will love pretending to tackle all the jobs an ordinary digger can tackle, and with forward and reverse gears there will be no shortage of scenarios they can concoct. 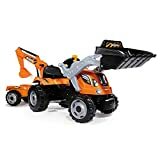 Overall, a fantastic replication of a digger for the little ones to enjoy, and with many authentic features, this will satisfy even the pickiest of children. The tractor was designed to be durable and hard-wearing, which makes it perfect for a young child who is just beginning to play with toys. The front loader is capable of both tipping and scooping, which makes it ideal for a realistic and fun experience. This is further complemented by the detachable trailer, and the bonnet does open up, which allows for the practical experience of pretending to stop and repair or check the engine. All of the great and cleverly designed features will ensure that your little one has a fantastic time behind the wheels of his or her very own tractor. Another great point is that the tractor is pedal operated, which is a great way for your little one to get some exercise and have loads of fun at the same time. This model really will appeal to the younger farmers out there, with the detachable trailer being as durable and practical as the rest of the vehicle. The pedal-powered system makes for a healthy and rewarding experience, and the steering wheel comes with authentic tractor noises to enthral your little ones and ensure they have the most realistic experience possible. A hard wearing build means that children can go wild without risk of damaging the model, and the components are all easy assembled to make the tractor usable. The trailer is realistic yet simple to hitch up, which makes it easy for a little one to load up and drive the trailer around all day. Overall, a well-constructed ride-on tractor, and a great toy for a young aspiring farmer to get their first taste being a grown-up behind the wheel. The Smoby has been constructed to be an accurate replica of a model seen on the television, and accomplishes this task quite well, having been designed with longevity in mind and a hard wearing structure that allows for a toy that will last a long time. The front loader perfectly mimics the function of a real front loader and gives you an immersive experience, which is further complimented by the detachable rear trailer, which is easy to hitch up and use, allowing for your little one to get up to all kinds of adventures in his or her mind. This is perfect for a young farmer or tractor enthusiast who wants to get behind the wheel and wants to experience what it’s like to drive a tractor. In this way, it is guaranteed to provide hours of fun and creatively imagined entertainment time and time again. Designed with an emphasis on longevity and durability, this particular tractor has an opening bonnet, which provides a new layer of immersion to the experience, allowing for little ones to pretend to open up and check their engines. As well as this, the tractor has both front and rear hitching pins, which is in stark contrast to most other models on the market, who would usually only have hitching pins located in the back. Another positive point is the introduction of non-slip pedals; this means that young aspiring farmers will need to move the tractor with their manpower, which is an excellent way to get some exercise and have loads of fun at the same time. This realistic tractor is perfect for young enthusiasts who are keen to experience what it’s like to be behind the wheel of a tractor but, are just too young to do so.